Project obstacles and solutions: As part of a major rebuild of its student housing options, the University of Kentucky has just opened the $84 million Limestone Park I and II in time for the beginning of the 2016-17 school year. These new dorms will house up to 1,141 students. They are designed to be part of the university's Living-Learning Program which allows students of a specific major to share living space in the same buildings. These buildings are designed with both academic and residential spaces. The mixed-use Limestone Park facilities also include retail and restaurant space. Messer Construction was selected as the general contractor for these new facilities. Educational residential construction on a college campus has a lot of unique challenges. Working around an open and active campus makes construction more difficult. However, none is as critical as the construction deadline for turnkey operations. There is a firm date when students are expected to move in and any construction delays have to be avoided or overcome. This was the case with these new residential halls. Both of these facilities have seven floors, with the lower floor serving as retail and restaurant space. 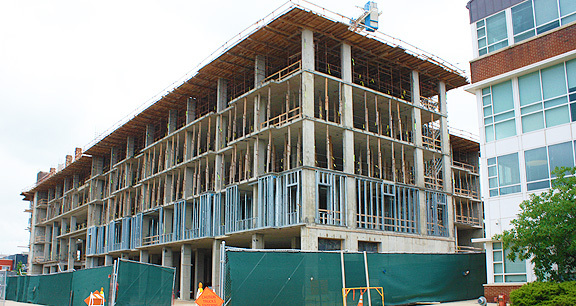 The upper floors were poured with post-tensioned reinforcement. The engineering specifications called for the concrete to meet an early strength of 3,000 psi in 48 hours before the tendons were stretched. These strength requirements had to be met regardless of the weather or temperatures. During colder weather, IMI QC/QA controlled the set time by adding water reducers and hydration stabilizers to the concrete to meet these parameters. IMI plant personnel and drivers also made sure concrete was delivered to the site without delays or gaps between trucks. Limestone Park I and II are located on the north side of the campus in some of the busiest parts of the university. IMI made sure trucks were parked in a safe staging area before approaching the pump to keep concrete moving. IMI supplied 18,000 yards of concrete for these projects. Messer met their deadline for both Limestone Park I and II. They opened their doors to students in time for the fall 2016 semester. For more information on gaining early strength in concrete or other ways to speed up set times, contact the sales representative for the concrete plant nearest you location. Click here.